Ladies, you’re invited to join us in the church basement for a Bible Study on Wednesday mornings, beginning September 12, from 9:00 - 10:30 a.m. Come and be filled to the brim and beyond with God’s Good News. 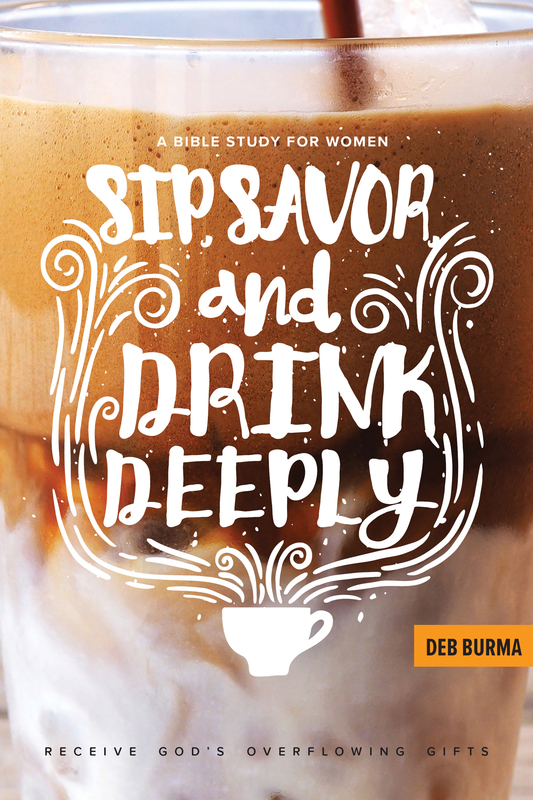 Sip, savor, and drink deeply from His word as we work our way through the book, “Sip, Savor, and Drink Deeply” by Deb Burma. The idea of a coffee break is enticing, isn’t it? Even if coffee isn’t your beverage of choice, you look forward to downtime, especially if it is spent with a friend who wants your company. Jesus is such a friend. The Lord wants our company. He invites us to meet with Him in His Word. Just imagine what He has in store for us as we meet Him with our “cup”—our self—a vessel created and chosen by God, redeemed in Christ, and ready to be filled for His purpose. Time spent in Bible study will fill you to the brim and beyond with God’s Good News. Sip, savor, and drink deeply from His Word. Receive the outpouring of His grace, His joy, and His peace! The study will be held on Tuesday nights at 7:00 p.m. for 8 weeks, beginning Tuesday, September 18. New Women's Bible Study: "Altogether Beautiful"
Women of all ages, married and single, are invited to join author Heidi Goehmann on an eight-week journey through the Song of Songs (through videos and a physical workbook), to draw near to God and His Word and discover just how much the God of the universe considers His daughters beautiful. Heidi will lead our study through weekly videos helping us to dive deep into the Song to extract the incredible beauty and truth found there. Each week, you’ll have five days of homework to complete in the workbook, designed to get you in the Word every day. IMPORTANT NOTE: The details for time and day will be coming soon, but we've arranged to host this study at the "Mom Cave" at the Gateway Guesthouse in downtown Unionville. You might not believe it, but you are. The world might tell you that your beauty comes from your curly hair or your long eyelashes or your perfectly spaced freckles, but the truth is you are beautiful because of who you are in Christ. Altogether Beautiful is a video-based Bible study of the Song of Songs that explores what it means to be loved fiercely and called beautiful by the God of the universe. Led by Heidi Goehmann, this study walks through each chapter to not only help you better understand and apply the wisdom offered in the Song, but also challenge you to securely ground your identity in the one who makes you beautiful—Jesus. Whether you’re married or single, young or old, you will find truth and comfort in the Song of Songs because this song, ultimately, is about the fierce love God has for you, His bride, whom He declares altogether beautiful. Heidi Goehmann is a deaconess (MSW, LISW) and a licensed independent social worker. She leads I Love My Shepherd Ministries and ilovemyshepherd.com, which exist to offer encouragement and usable resources for those in ministry and those to whom they minister. She describes herself this way: "I’m a writer. A Child of God. A professional woman. A wife. A theologian. A therapist. A mama. A wild heart. I do a lot of things, just like I eat a lot of foods. I created I Love My Shepherd because I was tired of seeing people pigeon-holed, put into boxes. I saw this happening in my life in ministry and as a Christian, as a woman, across cultures, and especially in topics and diagnoses surrounding mental health." The ladies of our LWML group here at St. Paul are asking for your help. Every year they send out a special gift to our college students to encourage them and remind them that we're thinking and praying for them. To do that, we need to make sure our list of addresses is current. As you prepare to send your college student (back) to school, would you take a moment to share their school address with us so that the LWML can include him/her? Please help us by either contacting the church office by phone at 989-674-8681, by email at stpaulluthunionville@airadv.net, or using the form below. Thanks! Last weekend, our Michigan District of the LWML met in convention. Our district meets in convention every two years, primarily for the purpose of designating mission grants for the upcoming biennium. 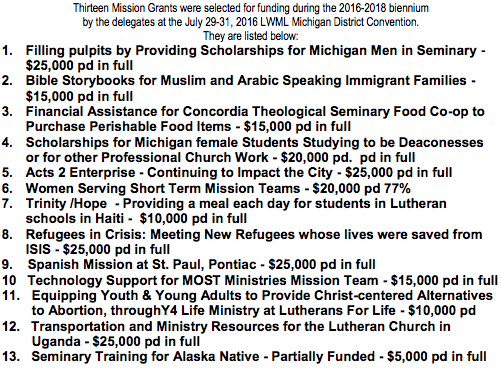 Mission grants are direct funding given to LWML members, societies, zones, circuit mission councils, and synod boards and Recognized Service Organizations (RSO) of The LCMS for specific ministries that extend the ministry of the Word in Michigan, across our country, and even around the world. These grants are funded by the "mites" collected and donated by the women of our Michigan District LWML-- spare change that they gather and turn in to their local LWML societies, which pass them along to the district. 75% of the mites collected are used to fund a set of mission grants selected at our district level. The other 25% is passed along to support the grants selected by the national LWML convention. We praise God for the commitment these women continue to show for the cause of spreading the Gospel both here in Michigan and around the world. We pray that He will richly bless the work of all of these ministries. In 2016, 13 mission grants were selected to receive funds. By God's grace, through the faithful giving of the women of our district, all the money requested through those grants was able to be paid. Our LWML is collecting items to assemble personal care kits for Lutheran World Relief. Donations can be left in the designated spot in the church narthex. Thank you for supporting this important cause!